Universal Car Dashboard Windshield Cell Phone Mount Holder Designed for you . 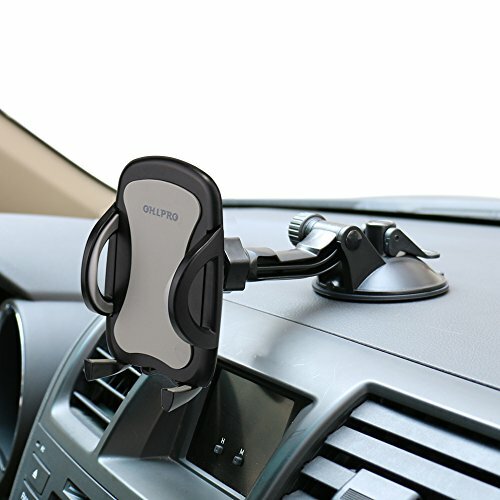 Universal Car Smartphone Mount It is compatible with all current smart phones 4" to 6". 2-in-1 Car Phone Mount - 2 Ways for Your Choose,Whatever You Want! Multi Functional, Rotatable, Convenient, Steady. Easy to Install, Use and Remove Easily adjustable and simple release button. Thanks to its super-strong suction cup, the car mount is able to adhere to smooth surface & attach itself firmly to some textured surface. Besides, it is easy to clean, rinse with water then air dry. 1. Clean dust on the surface before you mount the suction cup. 2. If the suction cup loses stickiness, you can rinse the suction cup with water and let it air dry. Generally it can restore stickiness after washing. 12 Months Warranty and 100% Satisfaction Guarantee Order 2-IN-1 Design phone holder for car risk-free. Just add it to cart and give your phone a new dashboard Windshield cell phone holder! If you have any questions, please feel free to contact our support team. We would love to hear from you and will respond as soon as possible generally within 12 hours. This mount holder works on flat surface only. To bring back the stickiness of the suction cup,simply wash the cup gel with warm water and air dry it. Do NOT force to pull up the suction cup. Do NOT mount or adjust the holder while you are driving. 1)2-In-1 Design: This car phone mount can be sticked to your car's dashboard / Windshield for convenience ,but not to block your view when driving . 2）360 Rotation: The 360 Degree Rotation phone holder for car lets you find the perfect angle to view your Smartphone at a quick glance. 3） STRONG Suction Cup: New generation suction cup of this mount holder with strong sticky gel adhere to windshield, dashboard and other smooth or textured surface;so you can keep your focus on the road and your hands on the steering wheel. 4）Compatibility: The car mount with extendable grip accommodates smartphone size between 4"-6.4" ,width is 2.14"-4.3" , including but not limited for iPhone X 8 7 Plus,7,6S,6, Samsung Galaxy Note S8 S7 S6,LG,HUAWEI and other smartphones and with its soft padding, securely holds your device. 5)Easy & Quick Installation: No tools required. Easy one press button to releases the clamps on your phone with just a push of a finger and please rinse gel suction cup with warm water and let it air dry to restore original suction strength if it falls off dashboard or windshield. If you have any questions about this product by Ohlpro, contact us by completing and submitting the form below. If you are looking for a specif part number, please include it with your message.